Portable truck scales were recently commissioned for a South Australian based chaff producer at their plant in Belvedere Ridge. Supplied by Accuweigh , the portable truck scales are being used for weighing both incoming and outgoing truckloads of chaff. Measuring nine metres long by three metres wide, the truck scale steelwork is fully Australian Made using locally produced BHP steel. Accuweigh’s truck scales feature a low profile design which significantly reduces foundation requirements and makes for a very cost effective installation. The modular design of these portable truck scales allows them to be easily disassembled into small light weight parts and transported without the use of expensive cranes and wide load vehicles. Similarly the length of these truck scales can be easily extended by simply adding another module without modifying the existing truck scale. All steel work of the truck scales is full hot dip galvanised for much superior corrosion resistance ensuring an extended operating life compared to cheaper opposition that are either painted or powder coated. 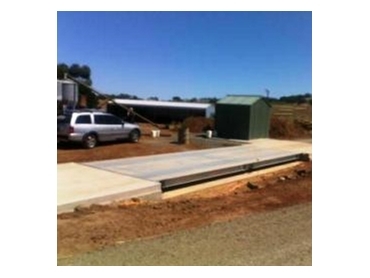 Full after sales service of portable truck scales is available from eight Accuweigh branches across mainland Australia.